It is 5:00 pm on Wednesday and after an hour delay in Frankfurt, I am finally in Madrid. At this stage, I do not fancy the 5 kilometres cycle to the hotel in the Centrum with only limited information on how to get there. So a quick walk in the terminal to the hotel shuttle stand and a comfortable ride to the hotel door. As I watch the roads going by, I am not encouraged about cycling in this city. 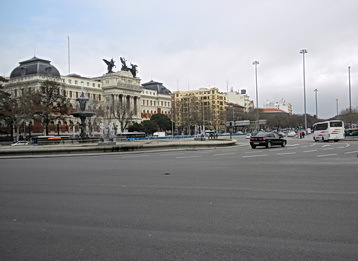 There has been little information available on cycling in Madrid. Fortunately, close by the shuttle service office, there was an information centre. No bike map of Madrid was available. Instead there was a booklet with maps of 10 different cycling trips in town and a mention of a 64 kilometre round the city bike route. More on this later. Apparently, there is a way to cycle to downtown form the airport. I did find the information on a map along the green cycling ring. When I went to check the route out, I found that one of the bridges on the way was closed to construction. So this will have to wait until a future time. Guess I will be going back to the airport with the shuttle again.